Hope these come to Philadelphia soon!! Yes, that looks like camo to me too! Love these. nope looks like blk camo. I don't like it however. there are a few things i like but i think i'm over my lulu obsesions..... the spell was broken w/ the whole ms. Day debacle..... can't get it back again.... now i may even sell alot of my lulu on ebay..... i am officially over it... however when items i do use wear out such as my basic black/grey tights i will replace w/ lulu ones since i haven't found any others that compare, that said i do like lulu but the spell of obsession is gone. Good thing though. I went through a two year phase prior to ms. day taking the helm and torpedoing the company, IMO, where i spent a lot of money on lulu. 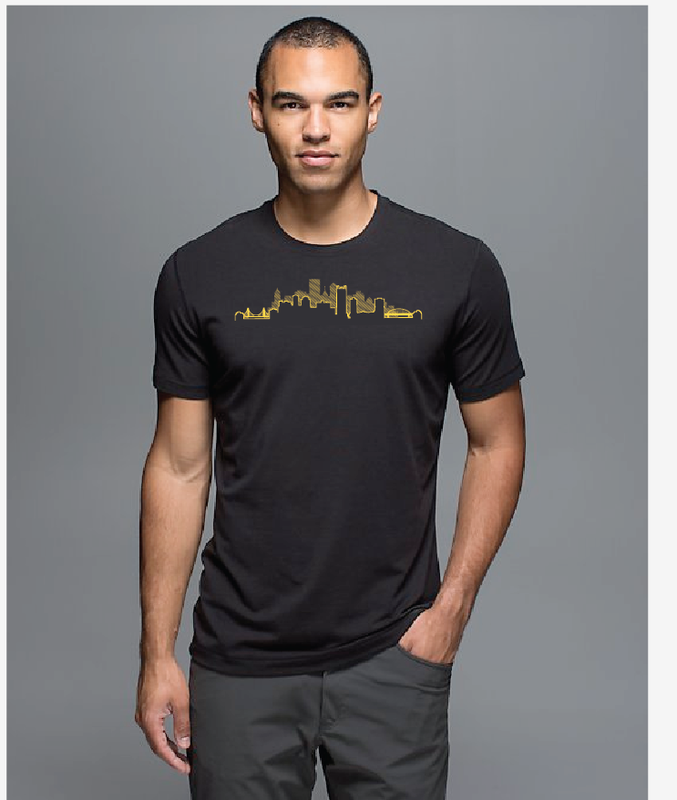 My husband is from Pittsburgh and his dad went in to the shadyside store to get one of the black 5 year tees with the pittsburgh skyline on it. They told him that they did not have any black 5 year tees and the website is also sold out. Umm???? Why advertise it if u cant accomodate?? They are taking orders up until 30 Nov then they send them out to be printed and can be picked up on 15dec. U can get other colors but they advertised the black! And the pittsburgh steeler colors are black and gold so thats probably what everyone there wants. So ridiculous. This is my local store -- stopped in over the weekend to get the details. You can buy any item in the store and then it's $5 extra to have it printed with the skyline logo. The nice thing is that you can pick whatever you want (pants, crops, etc.). I ordered WUPs. I can't decide if I want a tank, too. It's not clear to me if lulu is actually involved in the logo printing or not (I'm guessing not since I was told you have to pay the $5 in cash, separately). I assume corporate signed off on this though, so I would think that other stores could do something similar if they organized it. I thought I posted a comment earlier, but I guess it didn't go through! I was curious to know if you have any Intel about whether this will be a permanent feature in these select cities? It would be kind of a cool touristy thing in my perspective. I'm headed into Manhattan next weekend, so I'm going to pop into a store and see if there's any marathon stuff left over. I like the crops! I think this is a great idea! I would love if they did something like this in Seattle! They still shouldnt advertise things that they dont have like the black 5 year tee. @ anon 10;30 am - I agree but I guess it was to give you an idea that you could have it printed on a men's tee. @ Heather - I am seeing a lot of custom, local items popping up from stores on my newsfeed - Chandler, AZ, San Francisco, etc. so I definitely think lululemon is headed that way. It's a really cute idea. One of my favorite Sea Wheeze souvenirs is the special editiona bicycle tank they printed up to celebrate the Robson store grand opening.